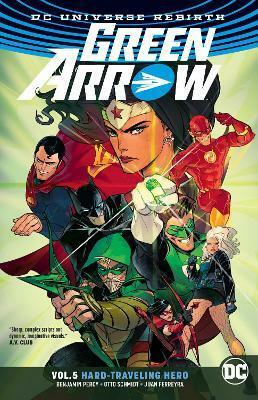 Green Arrow has lost his fortune, and now he is hitting the road to save America in Green Arrow Vol. 5: Hard-Traveling Hero. They're called the Ninth Circle--a criminal bank that funds war, terror and carnage, all in the name of racking up profits. They stole Oliver Queen's company from him and nearly destroyed Seattle, only to rebuild it in their own image as Star City. Now they've got their sights set on the rest of the United States. But Ollie is having none of it. As Green Arrow, he's setting out across the U.S. to piece together the clues that will lead him to the Ninth Circle, one brawl at a time. And though Green Arrow's never been much of a team player, his travels find him crossing paths with heroes like Batman, the Flash, Green Lantern, Wonder Woman and Superman. But before they can team up, Ollie will have to make amends for the jerk he's been in the past. Even with the full might of the Justice League behind him, can Green Arrow take down an organization so powerful they're seemingly above the law? Or will his quest just paint a target on his back so big that even Ollie can't escape it? Acclaimed novelist Benjamin Percy (Teen Titans, The Dead Lands) and artists Otto Schmidt (Guardians of the Galaxy) and Juan Ferreyra (New Suicide Squad) bring Green Arrow back to his hard-travelin' roots! Collects Green Arrow #26-31. Benjamin Percy is the award-winning author of the new novel The Dead Lands, as well as Red Moon, The Wilding and the short-story collections Refresh, Refresh and The Language of Elk. A native of the high desert of Central Oregon, Percy also writes nonfiction, which has appeared in Esquire, GQ, Time and more. He is the winner of the Pushcart Prize, a Whiting Award and the Plimpton Prize for fiction. Percy currrently writes GREEN ARROW and TEEN TITANS for DC Comics.